The start of a new year often goes hand in hand with other new developments or announcements. 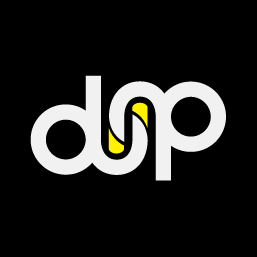 For Studio diip that means that we’ll soon have a new exciting product to announce. Unfortunately we can’t disclose too many details yet, because we are awaiting confirmation of the patent registration for this new device. We won’t be running this project on our own though. We have partnered up with design studio Oak & Morrow and Miller B.V. so we have all the necessary skills to make this product a reality. To make this joint effort official we have started a new coorporation in the United States of which all companies own some shares. Not only does this mean that we got a nice stamp from the State of California, it also means that Studio diip now partly owns a US company. Check in soon for more news about this project! Sketch & Cut – Your drawing automatically cut by laser! Draw a shape on any material, put the drawing in Sketch&Cut and a laser will automatically cut your object for you. Sketch&Cut is the latest development in laser cutting, but it is so simple to use that anyone that is able to make a drawing can use it. By combining laser cutting technology with computer vision Studio diip has developed a stand-alone, easy to use laser cutting machine that can be used by everyone with a pencil. Classic laser cutting devices use technical, computer generated 2D drawings created in software like CorelDraw or Adobe Illustrator. To use the Sketch&Cut laser cutter no technical skills are needed; just draw by hand what you want to cut or engrave and it will be done exactly like you drew it. You don’t even need a computer! Sketch&Cut is useful for a lot of different disciplines but it is especially suitable for creating models, prototypes, jewelry, stencils, personalized packaging, signs and engraving. Sketch&Cut is fit for home use, for artisans, hobbyists and artists, but it can also be used for business and educational use. In 2013 we came up with the idea of combining our core expertise, computer vision, with one of their passions, the maker industry. We started testing the idea of a hand drawing laser cutter by buying a laser cutting machine and attaching a webcam to it. After experimenting with this setup for a while it became clear that we were able to write software that made it possible to recognize hand drawings. We then proceeded to translate these drawings into controlling a laser cutting machine and the first prototype was created. In the current system the camera takes a picture of the material in the cutting area. This snapshot is used to detect the lines with computer vision technology. With a touchscreen you can then indicate what parts need to be cut and what needs to be engraved and just press the start button. The machine will then decide the best way to cut your drawing. After a year of fine-tuning the concept and developing several prototypes we are preparing to take the leap to a Kickstarter project in the near future. We are hoping for your support in this campaign, so be sure to check our site regularly for updates! https://www.studiodiip.com/wp-content/uploads/2018/05/diip-rgb-1.png 0 0 diip https://www.studiodiip.com/wp-content/uploads/2018/05/diip-rgb-1.png diip2014-11-24 16:16:482018-05-24 14:32:23Sketch & Cut - Your drawing automatically cut by laser! Today Studio diip launches a new product called the MVX System. This system is a computer vision platform that can be placed anywhere to make processes smarter by performing computer vision functions. You can read more about MVX at the new website www.mvxsystems.com. The MVX system is a processing computer that can be connected to all sort of cameras and other peripherals. It runs software that can easily be tailored to specific situations because of its modular nature. 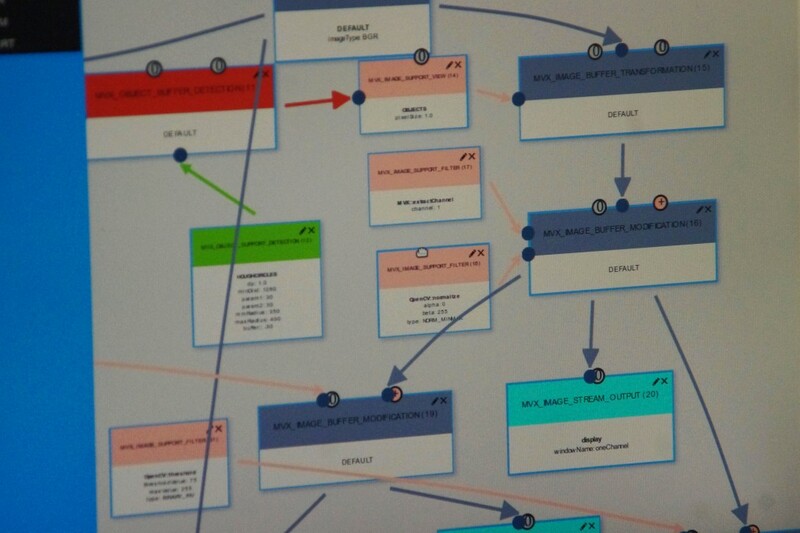 The software contains building blocks that can be combined with a drag and drop interface to create intricate computer vision solutions. 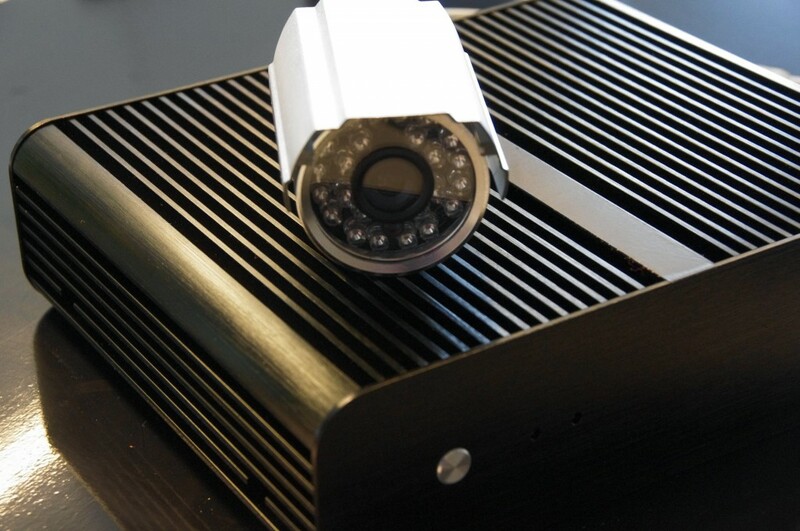 The MVX system is able to connect to a broad range of cameras, but also to various other devices providing the opportunity to control systems, monitors or communicate to online servers. An MVX can be configured to detect the quality of fruits and switch a sorting machine accordingly. That same system can be reconfigured to count the number of people that pass by in a certain area or to detect diseases on microscopic images. The flexible nature of the MVX system makes it very suitable for short term applications. The fact that there are no additional development costs for the software also makes the pricing transparent. Read more about MVX systems and their use on the website! 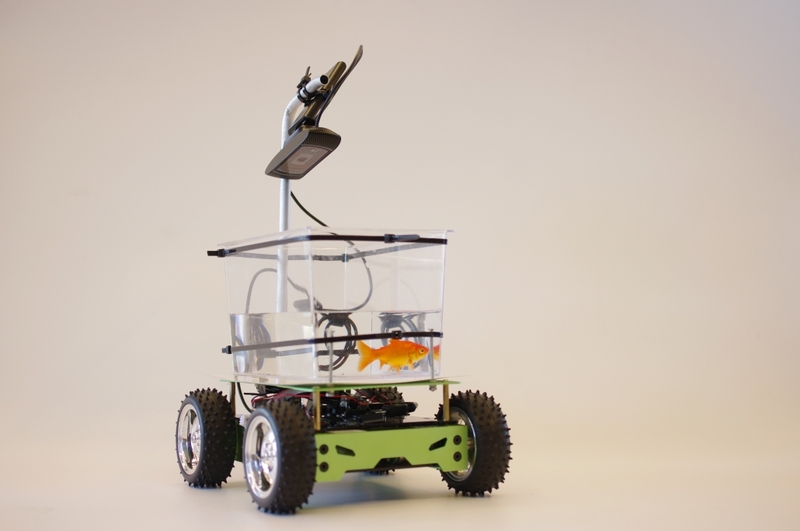 As part of the exhibition Sense Nonsense our Fish on Wheels will be on display at the Van Abbemuseum. The exposition is a collaboration between the museum and the Design Academy Eindhoven and is also part of the Dutch Design Week 2014. At the beginning of this year Fish on Wheels received quite some worldwide media attention. The device featured in many different TV shows, theaters and online media. This is the first time it is part of an official exhibition and open to the public. If you’d like to see Fish on Wheels drive around be sure to stop by the Van Abbemuseum from the 18th of October till the 9th of November.